Shipboard cranes are designed to achieve a short term payback based on a high cadence of production and working flexibility. Shipboard grabs are adapted to be used in scenarios where maximum crane and grab availability during port cargo loading and unloading is required. In contrast to harbour cranes that could offer a more continuous duty, shipboard handling systems remain in standby mode while the vessel is in transit, and should be ready for full efficiency when it arrives at the destination. Due to berthing fees, the maximum tonne per hour cadence should be achieved to improve overall operation costs and benefits. Experience: with more than 3,000 working grabs present in 52 countries, the experience achieved during 49 years offer a long term warranty grab solution (see Image 1 above with some shipboard Blug grabs examples). High-capacity: Blug’s bulk handling clamshell grab range goes up to 45m3 nominal capacity so that vessel loading and unloading time lapse is minimized. The weight of the grabs themselves is minimized due to Blug design patents, computer-aided design tools and finite elements analysis optimization — in this way, grab capacity can be increased for a certain crane lifting capacity. Cycle time reduction: in combining the highest grab capacity for each project/crane’s requirements, cycle time should be minimized to improve overall production cadence. The current market situation demands fast loading-unloading cycles to minimize docking costs. That’s why Blug grabs are always designed to give priority to the reduction of opening and closing operations’ time. Working flexibility: within bulk handling applications, there are several materials with very different material properties (density, granulometry, flow patterns, dust particles, degradation properties) that need to be considered when designing the grab geometry and power features. A perfect balance between capacity and the weight of the grab should be defined to avoid any inefficiency during grab loading. That’s why Blug’s grabs offer different alternatives to adapt their capacity maintaining their structure and main motion elements. Apart from the modular concept, that make it possible to integrate different grab arms/valves to the same structure for different materials, other available options are the removable closing plates or grab spreading limiting systems. Operational costs: the current market demands overall cost-effective solutions that combine a competitive purchase/rental price, but also to remain effective over grab working years. Blug’s grabs offer low maintenance costs over time, thanks to their high-quality steel properties, with hardness up to 600HBW (Hardox type) and yield strength between 650–700Mps (Weldox type) that prevent wearing/deformation and increase the grabs’ working performances. These properties are also combined with Parker brand hydraulic components for the motor grab range. The electric efficiency is one of the aspects that have been developed during the last few years so that oil heating and grab power consumption could be minimized. Variable- flow hydraulic system allows Blug grabs to be among the most environmentally friendly solutions on the market, offering the highest capacity vs engine power for its electro-hydraulic range. Shipboard specialization: in addition to the Blug grabs’ standard features, there are some key aspects which need to be considered to adapt the grabs to shipboard working and stocking. One of the most important points is to define a stable area on the vessel deck where the grab could be securely moored during transit periods. This platform of structure could be also used as a base point for grabs’ maintenance. Another point to be considered is the steel corrosion due to sea water contact with the grabs. Blug grabs include stainless steel rods and articulations design so that no corrosion could affect the grab’s normal operations. The steel structure is also protected with anti- corrosive epoxy coating according to C5-M painting system (ISO 12944-2 standard). Finally moving parts are protected with articulated steel covers or elastic sealing systems so that the most exposed parts could be protected from impacts and/or contact with material during loading cycle and grab movements (see Image 2 — shipboard grab special features). Recent deliveries include a 20-tonne capacity mineral handling clamshell grab for north of Africa, one 18-tonne capacity scrap handling rope-operated orange peel grab for the European market and three 10m3 capacity bulk handling clamshell grabs for the Spanish and Asian markets. Some new orders have been signed for the supply of two scrap handling grabs for the South American market and three cereal handling 15m3 clamshell grabs for eastern Asia (see Image 3 — recent deliveries). For more than 60 years, PEINER SMAG Lifting Technologies GmbH — PSLT for short — with its product, PEINER grabs, has stood for quality and customer satisfaction in the field of bulk goods handling. The wide range of products allows PSLT to provide the right answer to every customer request in the field of geared bulk vessels. Owing to its many decades of expertise in the development and construction of grabs, its customers have put their trust in the company and relied on PEINER grabs particularly in the difficult market situation of recent years. To further develop this expertise, the company makes above- average investments in the research and development of products. Thus, new designs and alternative materials are continuously brought into serial production. The goal of PSLT is to continuously improve its products while taking into account the requirements of the market. At PSLT, the customer is always in the centre of attention. The size, shape and dead weight of grabs may vary and, therefore, be tailored in every respect to the needs of customers. PEINER grabs are adapted both for lifting devices and for each application to always find an optimal solution. PEINER deck crane power supplies accessories, PEINER grabs can be operated with any common deck crane. For geared bulkers without deck crane accessories PSLT supplies PEINER deck arrangement towers. These towers are flexible and quickly ready for operation. A well-proven alternative to electro-hydraulic operated grabs, especially for countries with weak infrastructure, is the PEINER radio-controlled single rope grab. It is particularly suitable in this case because it is not only compatible with many lifting devices (a simple crane hook is enough), but also impresses with its user-friendliness and versatility. Using spill and kick plates, the grab can be adapted for a variety of bulk materials. Thus, within a very short time, any deck crane can be used for bulk goods handling without additional equipment. An external power supply is not required. The maintenance is reduced to a minimum thanks to the use of high-quality materials such as HARDOX and WELDOX in combination with an optimized design. It keeps the life-cycle costs as low as possible. A modular design allows to use standard parts in different grab models, which greatly simplifies the storage and results in faster response times in the production of new machines and after-sales management. Thanks to the intelligent design, it is also possible to match up high grab capacities with low dead weight. Apart from the quality of PEINER grabs, PSLT is notable for its global service and dealer network that offers the customer round-the-clock customer service. In addition to the assembly and start-up provided by its technicians, the company also offers training for the operating personnel. Thus the customers of PSLT get everything from one source. A very important factor in entrepreneurial thinking is the issues of environmental protection and sustainability. Environmental protection does not begin only when the grab is finished. Both at the work preparation stage and in the production process, care is taken to reduce the impact on the environment. In addition, PSLT strives to keep the environmental impact associated with the use of grabs as small as possible. A number of features help to minimize the loss of bulk materials. In addition to dust covers, they include special sealing systems on the side and bottom lips.The use of steel sealing strips, rubber-sealed lips, overlapping bottom and side lips or special side toothing prevents bulk materials from trickling down. In contrast to the competitors, PSLT’s four-rope dual scoop grabs are also designed with just one, rather than two scoop pivot points. This results in a movement of the scoops that ensures a synchronous closing and excludes any offset between scoops. Liebherr Maritime Cranes has launched the game-changing technology SmartGrip for its mobile harbour crane product range. This unique technology operates as an intelligent system which optimizes grab filling rates in a self-learning manner. SmartGrip provides a number of valuable advantages, including higher performance and zero overloads. The development of SmartGrip is based on recent turnover analyses in various ports around the world. The data showed that, on average, only 70% of the grab capacity is used. There are many factors why the grab is not operated at full capacity, including suboptimal grabbing angle and varying material density. For crane operators the estimation of the material density and the right grabbing angle may turn out to be a real challenge.As a result, ports are faced with less turnover [tonnes per hour] than expected. SmartGrip is the solution to optimize grab filling rates. In a comprehensive field study, Liebherr collected real data of different crane models which were equipped with a wide range of grabs to handle different materials. Additionally, numerous crane operators ensured a broad spectrum of skill-levels during data collection. Thanks to in-depth analyses, Liebherr has deduced the ideal grab filling model by means of data mining. In operation, the self-learning system automatically adjusts its behaviour by recognizing bulk density, compression and granularity as well as current frame conditions like depth of impression or type of grab. Load cycle by load cycle, SmartGrip automatically optimizes filling to maximum capability taking grab size and outreach into account. Right from the second load cycle, SmartGrip ensures that the grab filling rate is above the average of 70%. Within a maximum of seven cycles the full capacity of the grab is utilized. Changing materials and varying density are the main challenges for the crane operator in bulk operation. Furthermore, density also depends on depth of impression, which means that even when working on the same hatch, handling situation may change. If the driver needs to fill the grab manually, he may overload the crane when pulling the lifting attachment out of sticky material. Frequent overloads lead to a notably shorter lifetime of the crane. Additionally, frequent overloads are also time-consuming as the crane is automatically switched off if there is too much pull on the grab. SmartGrip controls the filling of the grab to suit the load curve of the crane. This leads to perfect crane utilization without overloading. Thus, SmartGrip also works as overload prevention system resulting in an extended lifetime of the crane, saving fuel and time. 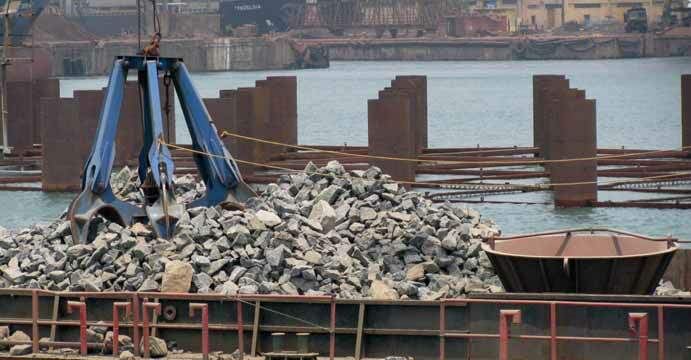 Bulk material handling comprises a number of challenges. To maximize productivity, the grab has to be filled to the limit, which means the driver has to fine-tune grab filling by opening and closing the grab as well as hoisting and lowering. This is both stressful for the operator and time-consuming. Achieved turnover depends on many issues, including available infrastructure, driver skills and materials handled. SmartGrip optimizes various parameters and allows for improved performance. In view of the average grab filling rate of 70%, SmartGrip offers a potential of up to 30% more turnover. Additionally, turnover variance is significantly reduced, leading to more efficiency in operation. Field studies showed that even up to 40% turnover increase are realistic if the grab filling rate is below average. Additionally, SmartGrip partly closes the gap between high-skilled and less-skilled drivers, as some important parts of bulk handling are automatically optimized by the system. To achieve substantial turnover increase the whole logistic chain needs to be considered. Liebherr supports its customers by offering detailed process analysis of the existing material handling infrastructure in order to harmonize transportation chains and to maximize efficiency. With the introduction of SmartGrip, Liebherr successfully continues its path of innovation. This new bulk handling feature is the perfect continuation of a number of game-changing technologies introduced to the market in order to optimize bulk handling. This includes Cycoptronic®,TeachIn, Pactronic® and of course also the LiSIM maritime crane simulators for professional crane operator training. In close proximity to its customers, Liebherr will continue to strongly invest in research and development in order to launch innovative features designed to increase safety and productivity while emissions are reduced at the same time. The TTS Group ASA has an enviable pedigree for designing and developing specialist equipment solutions and services for the marine and offshore industries. With over 50 years’ experience on the global stage,TTS’s reputation for developing innovative, high-performance and cost-effective solutions has propelled them into the top three largest suppliers in the industry. And nowhere is this experience more apparent than with the company’s capabilities in the design and supply of marine and offshore cranes. With lifting requirements always being specific to the vessel type, the Norwegian-headquartered company has developed standardized building blocks which are able to tailor a solution to a specific vessel. TTS believes this is of critical importance, ensuring that cranes deliver maximum productivity, and operate safely, whilst reducing downtime and related costs. Recognizing that markets and applications are constantly evolving,TTS has developed one of the most advanced range of bulker cranes currently available. The Type TLB cranes offer safe working loads of up to 45t and are characterized by their robust design, delivering proven reliability and high cycle times. A common feature of all TTS cranes, the TLB has an unlimited slewing range of 360 ° and the equipment and machinery is mounted inside the crane housing to protect it against maritime atmosphere. Operation in the first layer on the winch drum ensures a long lifetime of the wires. Furthermore, the cranes are equipped with proven TTS electronic control PLC and digital operation display in the crane cabin as standard. All movements can be done simultaneously and provide stepless operation. To ensure a safe workflow the TLB has an automatic speed reduction of hoisting and luffing before the limit switch is activated. For additional safety, the driver’s cabin is protected by a security cage. Included in the range is the TLB-V, a four-rope grab crane designed for heavy duty applications, particularly in rough conditions. The four-rope configuration has a lift capacity of up to 40t and provides excellent visibility for the crane operator along with safe and efficient cargo handling. A further option in the successful bulker crane range, and one of the latest developments, is the TLB-e. All major parts of the crane hoisting and luffing, as well as the slewing motors, are electrically driven, again ensuring high cycle times but with much reduced noise levels. This configuration provides much improved energy efficiency when compared to conventional hydraulically driven cranes. Naturally, this results in lower operational costs as the electric drive system replaces hydraulic oil as well as all major hydraulic components. In addition, the energy from the ships generator requires no transformation into hydraulic pressure to operate the crane, meaning energy is only consumed when the crane moves. Adding to the TLB’s attraction is a number of features that boost operator productivity and safety. All TLB cabins feature an effective air conditioning system as standard, together with an anti collision system designed to reduce the possibility of accidents. Also as standard equipment, the TLB benefits from a remote maintenance system, providing ongoing diagnostics and maintenance data, contributing considerably to reducing on-site service costs. A COMMITMENT TO THE FUTURE — INNOVATIVE PRODUCTS AND EXCEPTIONAL SERVICE The TTS Group’s activities centre around the design, assembly and testing of equipment. Apart from the manufacture of certain key components, production is generally undertaken by a global network of specialist subcontractors. TTS works closely with customers to devise innovative solutions that improve productivity, quality and system capabilities. This in turn improves their customers’ profitability and competitiveness. A good example is the company’s ability to assemble complete project teams when expertise in a particular field is required. The group currently has subsidiaries in Brazil, China, Finland, Germany, Greece, Italy, Korea, Norway, Poland, Singapore, Sweden, USA and Vietnam, plus a workforce of around 1,100 people. Continuous investment has resulted in unprecedented growth over recent years and this is particularly evident in the strength of the after sales services. The company clearly demonstrates its commitment to customer support with centers strategically located around the globe. Recognizing the operational pressures the marine industry faces, particularly in the areas of cost-reduction, the company’s range of intelligent and innovative service solutions has evolved to become one of the most far-reaching available today. TTS will say that best equipment deserves the best levels of service and it’s evident that’s exactly what it strives to deliver to its customers. With a worldwide network of branch offices, service stations and agents that provide after sales services covering the major shipping regions of the world, the company is confident that its success is well set to continue. In January 2013,Verachtert Netherlands acquired DCC-Grabs, enabling it to expand its grab portfolio significantly. Prior to the acquisition,Verachtert offered only hydraulic grabs. By absorbing DCC-Grabs, it can now offer mechanical and electro-hydraulic grabs. Verachtert has worked hard to ensure a seamless integration of DCC-Grabs within its organization. It has had to incorporate the expertise, processes and systems of DCC-Grabs, as well as combining two different knowledge bases. Verachtert designs, develops and manufactures grabs for the dry bulk cargo, dredging and recycling industry. It can guarantee innovative design and product development, and prides itself in its ability to solve specific problems for its clients. It ensures an excellent price-quality ratio of its grabs, as well as low maintenance costs. dredging industries, due to the strength, low empty weight and excellent quality of each grab. Therefore the grabs are guaranteed to achieve high returns on investment, and save valuable time. Each grab is thoroughly inspected and tested prior to delivery to the customer. Grabs are manufactured with a relatively low weight, and assure customers high productivity. All are manufactured from high quality and durable, wear- resistant materials. Verachtert provides work tools for all types of excavators and wheel loaders. It also offers a wide variety of grabs. and to make important components accessible. All of this is done with the needs of the customer in mind. Verachtert specializes in selling and renting new and used work tools. It also offers service and repair services, and holds a large stock of spare parts — most of which it can ship to the customer within 24 hours. The product range includes quick couplers, buckets for excavators and wheel loaders, grabs and demolition tools including shears and hammers. Verachtert’s work tools all come with an extensive service package containing everything, from advice in selecting the right equipment to after-sales and support in maintenance and repairs. It has an excellent workshop maintenance and repair facility, and also has field mechanics that it can send out to the customer’s site if necessary. The acquisition in January 2013 of DCC-Grabs has helped Verachtert increase its presence in the local and the global markets. Recently, the company has won business in Africa and in the rest of Europe. Verachtert is ambitious — it wants to have a wider range, not just of products but also in terms of the geography of its customers.